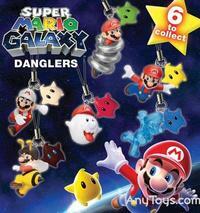 Fans of mobile phone charms will gasp in delight when they see these cute danglers, as they’re all Mario themed and intricately detailed. There are six to collect and because they’re packaged in adorable capsules it’s pretty much pot luck what you get. Each order contains three capsules which have three danglers in them, so hopefully you’ll get your favourite!